Another shark video is making the viral rounds on the Internet. But rather than be one that invokes sadness or anger for depicting some poor trophy prize hung by its tail or a sea of shark fins drying in the sun, this short video from South Carolina illustrates a unique quality of what is considered to be one of the more aggressive sharks. Along South Carolina's North Myrtle Beach is House Creek which is fed by tens of smaller creeks and streams and ultimately spills out to the sea. This transition from fresh to saltwater makes for brackish water that some ocean fish are able to tolerate. 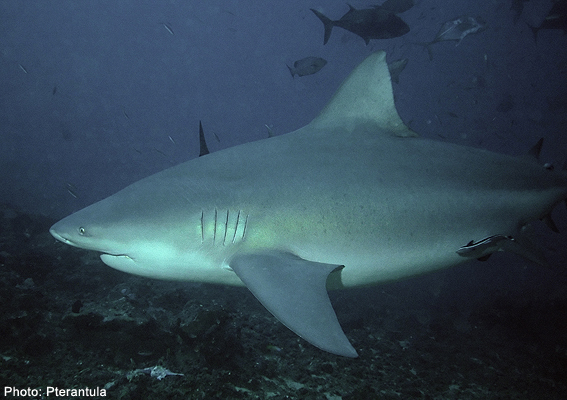 One such animal is the bull shark. If you have not yet seen the video, a young woman, Sarah Brame, accompanied by her fiance and stepfather, was fishing off the dock at Cherry Grove Inlet, a small body of water connected to House Creek by a small feeder stream. As she was reeling in her first fish, a local variety called drum, a 5-6 foot bull shark suddenly lunged, breaking the surface and taking her catch in one swift flurry of splashing water and hungry shark. Quite a remarkable piece of video (see below). What makes the video all the more remarkable is its illustration of the bull shark's ability to withstand brackish to near fresh water, which allows it to move up streams and rivers and get into places where you least expect to find a large shark. 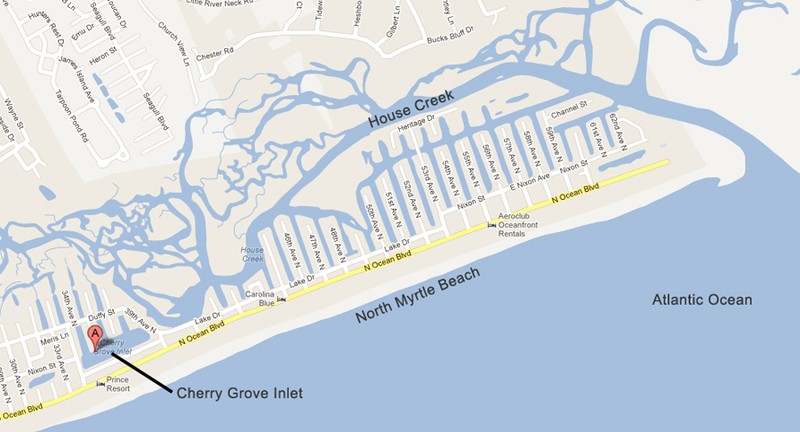 (See the map of the Cherry Grove Inlet and House Creek.) Bull sharks have been found many miles upstream in South American rivers and the famous Matawan Creek shark attack of 1916 in New Jersey, which many at the time attributed to a great white, was, in hindsight, very likely a bull shark. Bull sharks are also one of the more aggressive sharks. Aggressive in that, when on the hunt, they do not rely on a single massive bite, like a white shark will do to a seal (or a mistaken swimmer). Instead, the bull shark will hunt large prey with repeated bites. This has been borne out by reports of swimmers or surfers who, when attacked by a bull shark, found that it would give chase and bite repeatedly in a rather tenacious, never-give-up manner. While a bull shark, like all sharks, do not single out humans as a specific prey, it is this determined behavior by the bull shark that puts it in the top four of most dangerous sharks (the other three being, white sharks, tiger sharks, and oceanic white tips). I have had the opportunity to get up close with a variety of shark species and the bull shark is the one that draws my utmost attention. After Sarah lost her catch in such a spectacular fashion, her fiance and stepfather contemplated taking their 10-foot boat out on the water to track down the shark, but after a few minutes on the water, they rethought the matter. "We need a bigger boat and a bigger net," said Van Hughes, Sarah's stepfather. "We need a bigger boat." Now, where have I heard that before. . . . According to Dan Abel, shark researcher at the Coastal Carolina University, "It's not like just because we saw this shark yesterday that was just chasing this fish that was struggling on a line means that everything is going haywire. They're out there all the time anyway. It just so happens that this one opportunity a person caught it on film." Just another apex predator doing its thing.